Our next WLPC online qualifier is on Friday 20th April! Did you miss out on VEGAS100 2018? Qualify for our 2nd Las Vegas trip later in the year and represent your country at the game you love! The World League Poker Championships (WLPC) consists of pub poker leagues from the USA and Canada, as well as the UK. The WLPC trip takes place between Sunday 4th November 2018 to Thursday 8th November 2018 flying out from Gatwick. Grab some poker and winter sun at the same time! 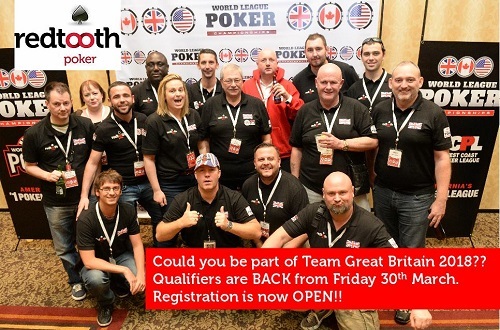 Get involved and win a seat into this fantastic poker festival on Friday 20th April 2018 at 8:00pm, only on Grosvenor Poker. The buy-in is £22 and you can also buy into the tournament using your £22 tickets. One WLPC seat will be awarded for every £950 in prize-pool and cash prizes will be awarded for any buy-ins over the £950 & £1,900 cash amounts. You can find the tournament under ‘Tournaments’ > ‘Partners’ > ‘Redtooth’. Need a Grosvenor Poker account? Click here to create your account.